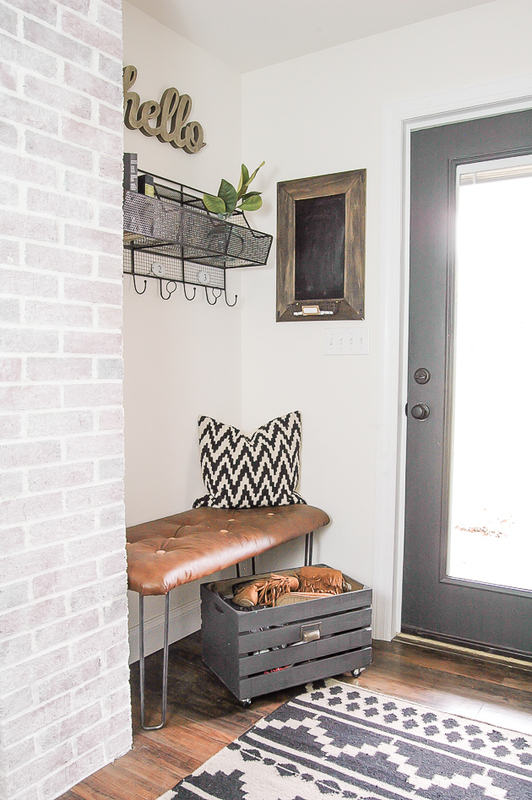 How to Get the Modern Farmhouse (with a touch of Industrial) Look! 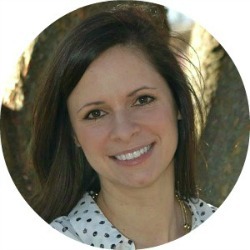 | Little House of Four - Creating a beautiful home, one thrifty project at a time. 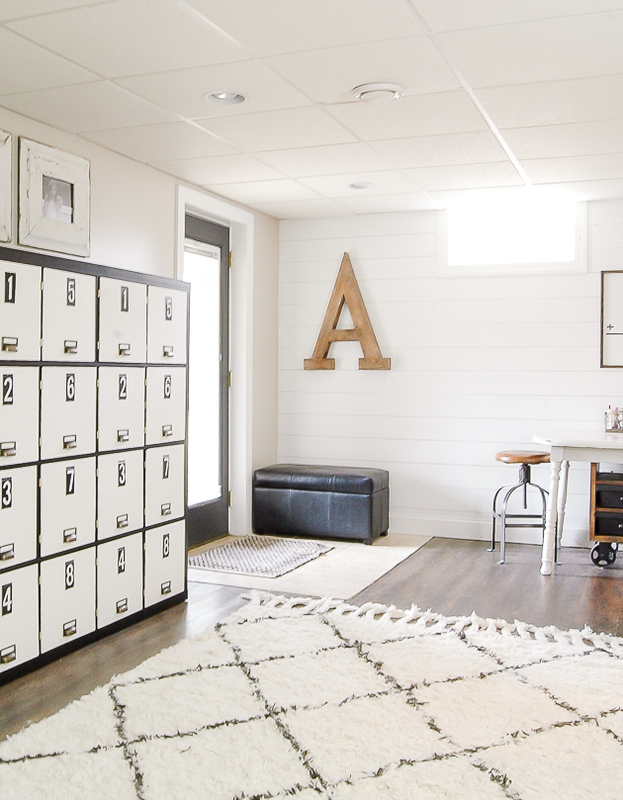 : How to Get the Modern Farmhouse (with a touch of Industrial) Look! 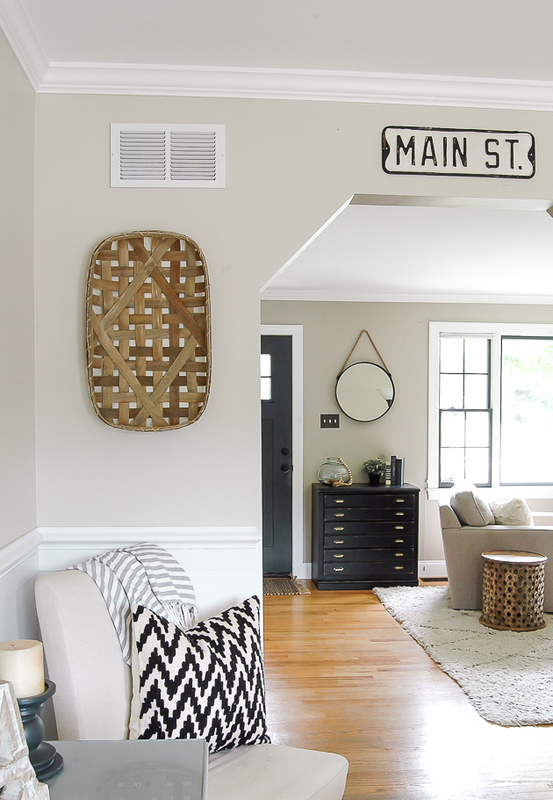 How to Get the Modern Farmhouse (with a touch of Industrial) Look! 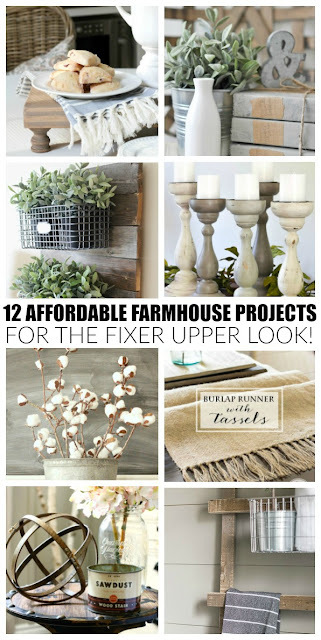 Easy and affordable ways to get the modern farmhouse look! 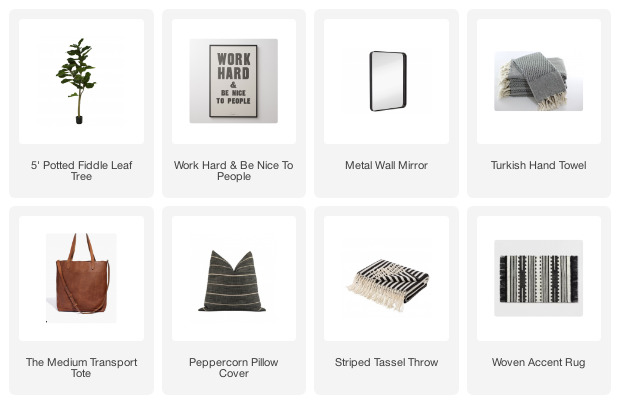 I always have a hard time defining my style, but if I had to put a name on it I'd say it's a bit modern, a little farmhouse and a touch industrial. I prefer to mix styles and think it's the best way to express your individual personality and make your home unique. 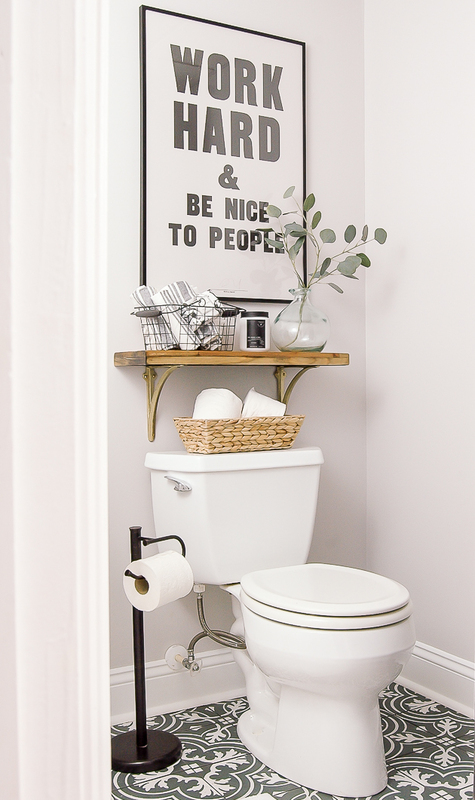 There's absolutely nothing wrong with mixing modern brass fixtures with vintage inspired tile or pairing thrifted furniture with shiny new pieces. What matters is that you create a home that you love and that is true to your own individual style. Our house is in no way shape or form a "farmhouse." 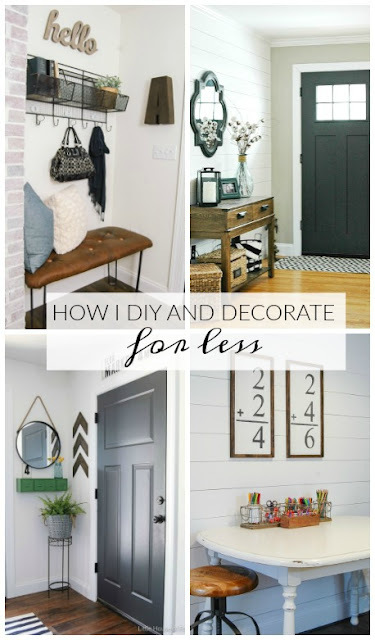 You won't find any chippy painted furniture, burlap table runners or cow prints on the wall. It is, however, a traditional rancher that was built in 1978 that lacked some serious updating. When we moved in over 12 years ago it was still rockin' much of its original 70's charm. From ceiling fans with floral globes to original moldings, wallpaper and light fixtures, our house was definitely dated and in need of some much needed love. 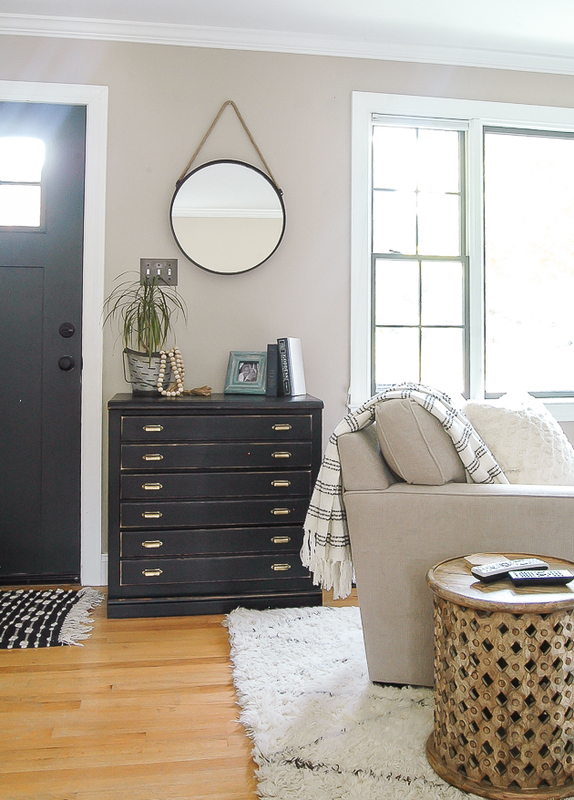 Over the years, we updated our home one room at a time to better fit our style. We replaced all the tile and molding, painted, changed light fixtures, added character and put a lot of blood sweat and tears into each and every space. It may not fit one particular style or follow what's trendy. Some rooms may even have a serious mix of decor, but I can honestly say our home is a place I love. 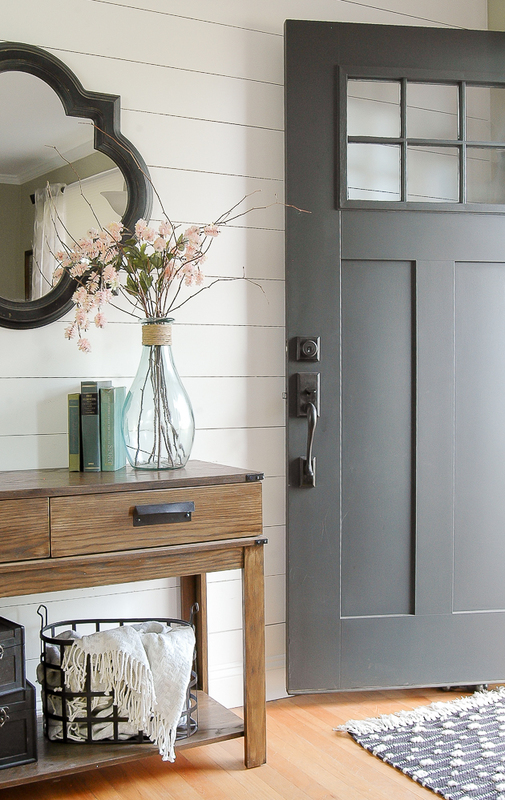 TIPS FOR ACHIEVING THE PERFECT MODERN FARMHOUSE STYLE WITH A TOUCH OF INDUSTRIAL. 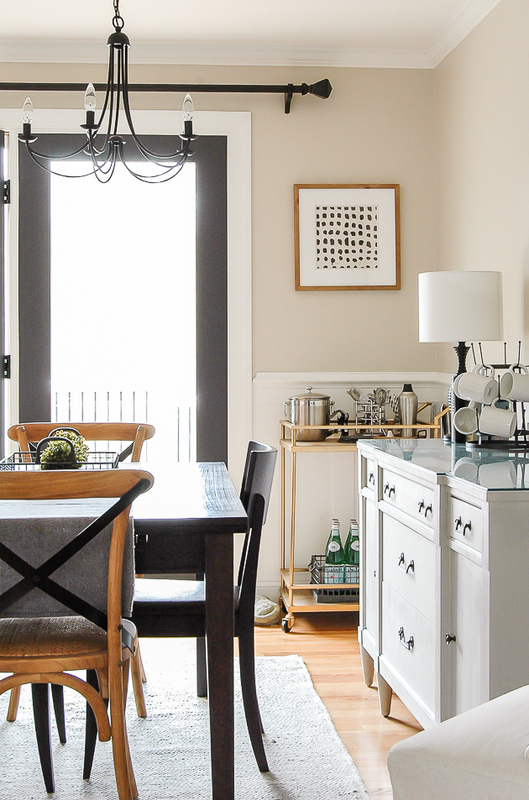 Whether it be with paint or furniture, adding contrast is a great way to make a space pop. 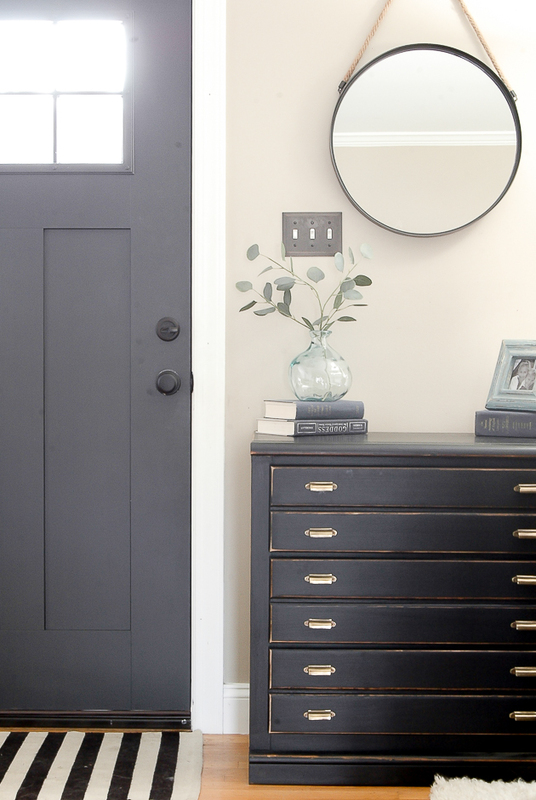 My favorite way to add contrast is by painting my doors dark and keeping my walls light. 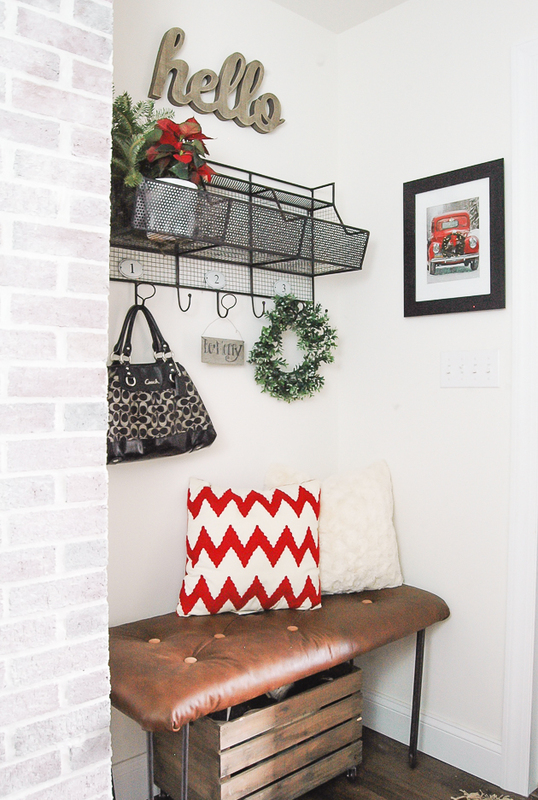 You know I LOVE Sherwin-Williams Iron Ore and think it's by far the quickest and easiest way to add contrast to a space. 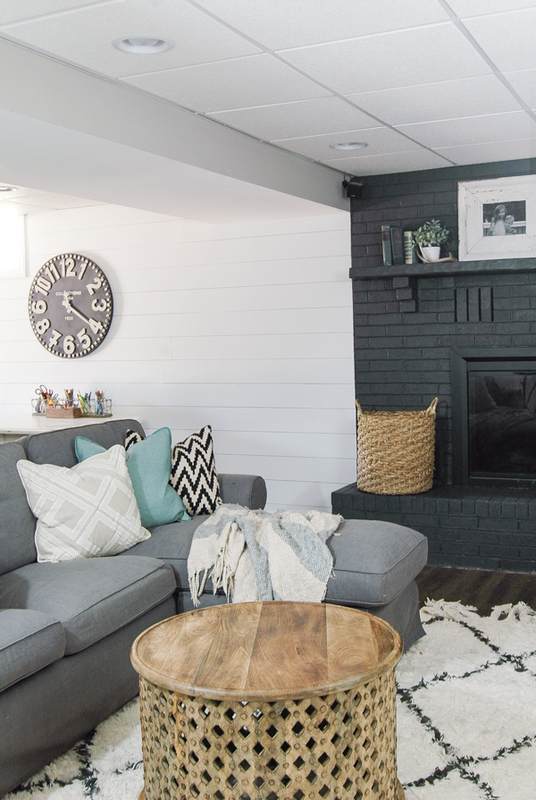 You can also add contrast by painting a large focal piece in a room like I did with our basement fireplace. 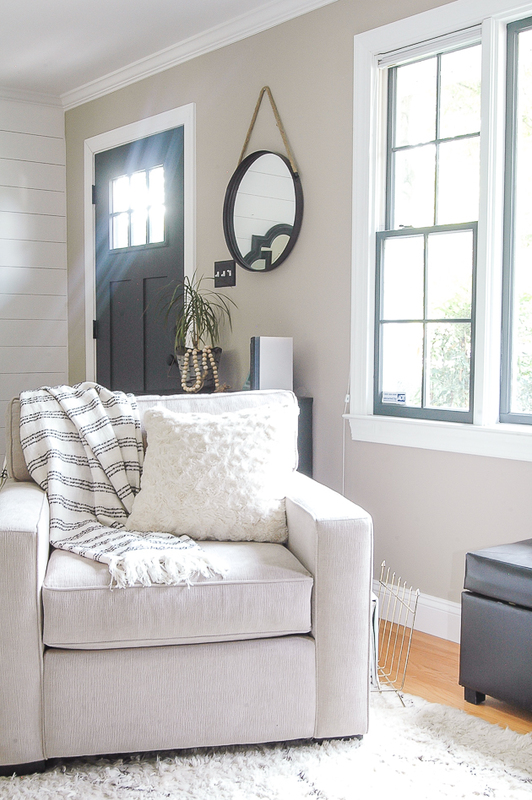 Piggybacking off adding contrast, painting your windows and trim dark is another great way to add contrast, define your space and create the illusion of architecture. 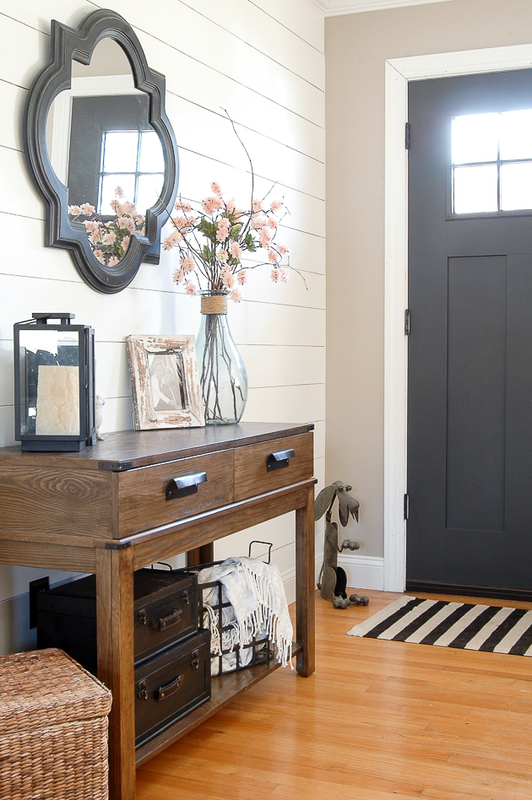 Mixing wood tones in with your decor is a great way to add warmth to your home, especially if you have hard lines, dark furniture or have painted your doors dark. 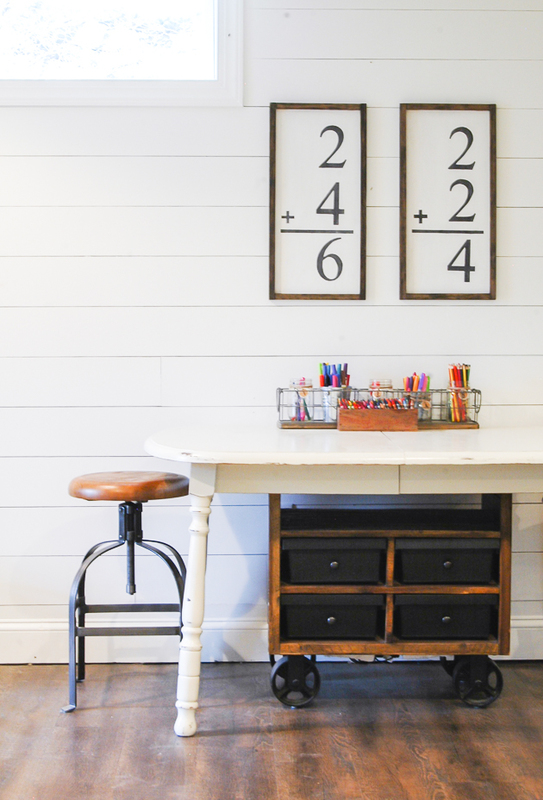 It can be as simple as adding wood frames and art to bringing in larger pieces such as chairs and side tables. 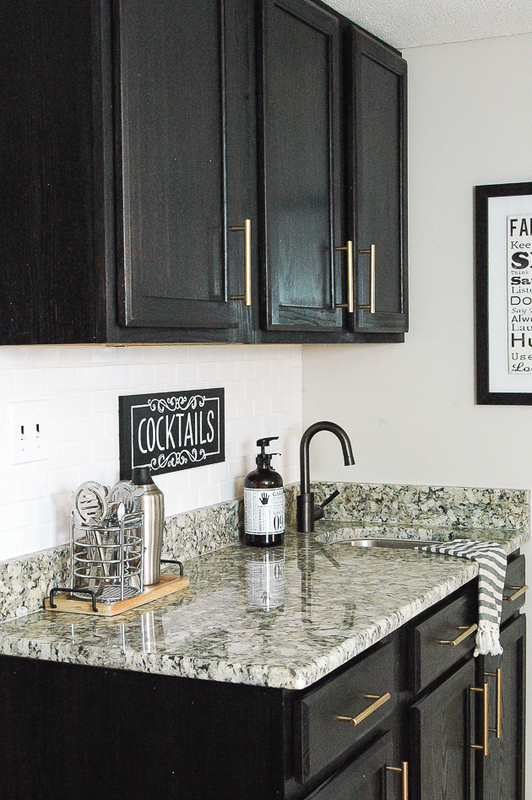 Subway tile is classic and perfect for any style. Use dark grout instead of light for a twist to this classic vintage material. 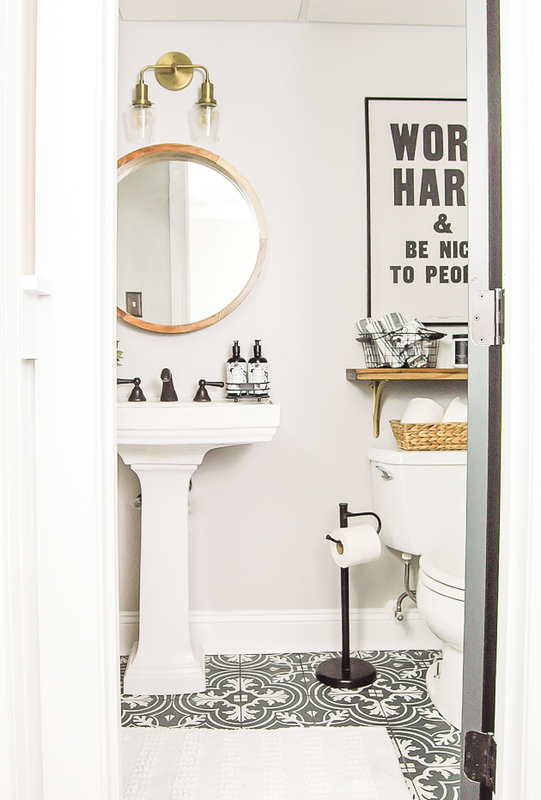 We (okay, I) opted to add bold patterned tile to our tiny basement bathroom, but if you're not quite ready for such a bold update you can still get the look with stencils or wallpaper. Neutrals don't have to be boring. 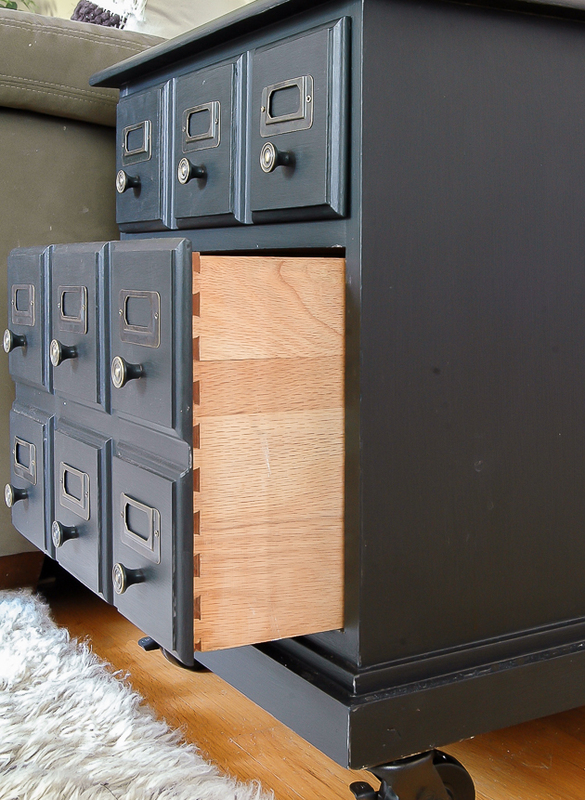 If you add contrast and accents of wood tones and gold, neutrals will help the rest of your space pop. Keeping your walls light also allows you to easily add color (think throw pillows, blankets, artwork, etc.) and easily transition decor from season to season. 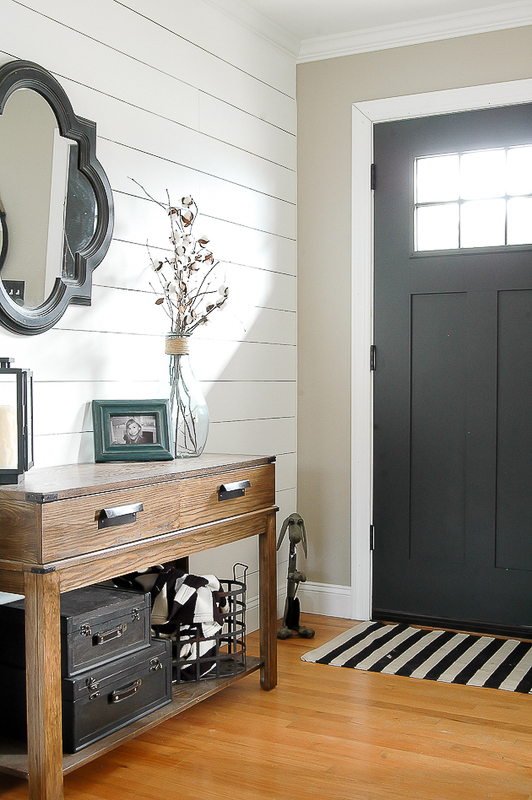 Shiplap is all the rage and a classic farmhouse characteristic. 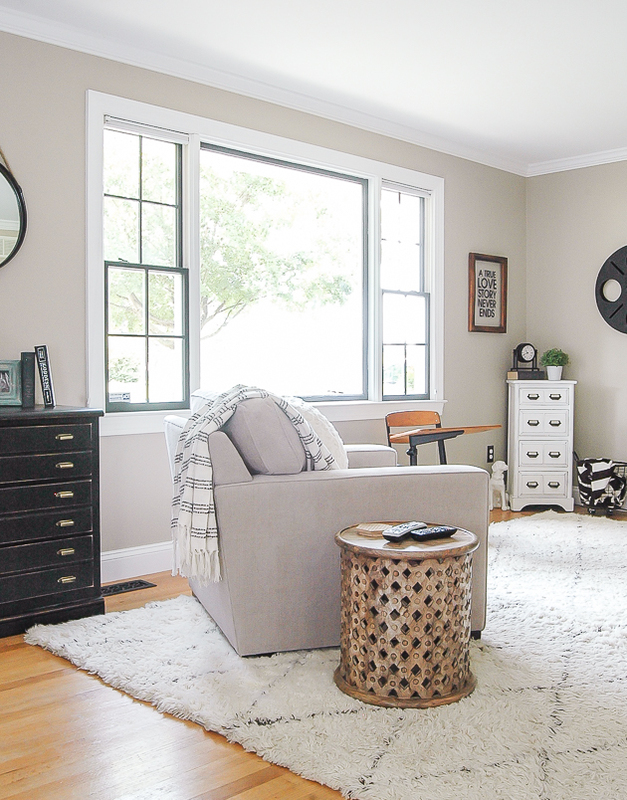 Get the look by adding inexpensive plywood to your walls for instant texture and interest. I love adding vintage, thrifted and unique pieces to our home. 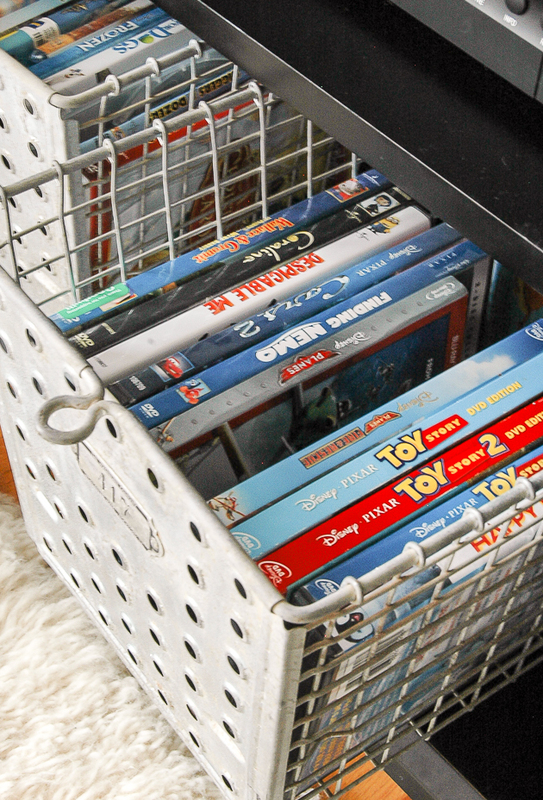 It's a great way to personalize a space, save money and make your home look a little more unique and a lot less ordinary. I'm sure you have gathered by now, that most of the rooms in my home incorporate a lot of the same elements. I may mix styles and I may not conform to a certain "mold", but I do what I love and that's all that matters. Follow your heart, be unique and create a home that you enjoy. 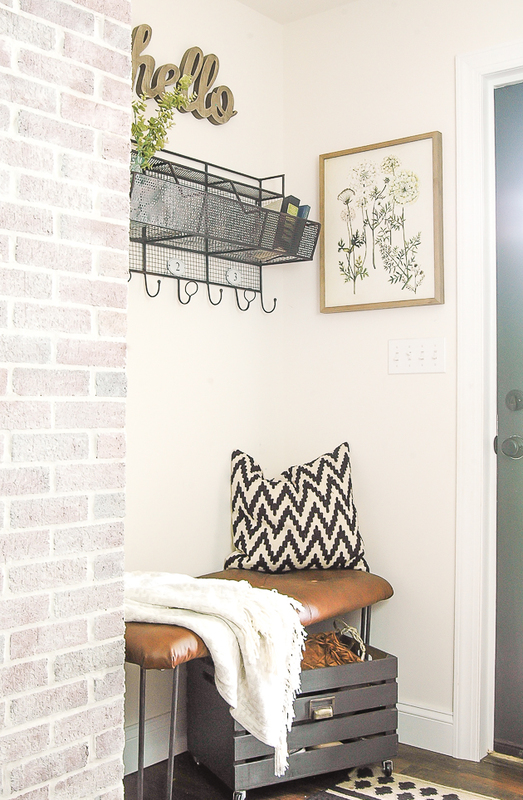 Whether that be modern farmhouse decor with a touch of industrial or something completely different. Do what YOU love and the rest will follow. love your iron ore paint. is it flat, egg shell or gloss? Thank you! I use SW's Emerald line in satin. It's a nice sheen that's wipeable, but not too shiny. Your home is beautiful! I too, like to combine styles, and don't confine myself to any one strict style. Thanks for sharing. Where did you buy the lockers in the last photo? I was lucky enough to be given them for free. My neighbor knew I was looking for a set, so when they were getting rid of them at his work he was kind enough to bring them home for me. I've also been able to find reasonably priced sets on Facebook Marketplace.